Zodiac medieval journal, horoscope diary with Virgo symbol, dark olive leather sketchbook, medieval sketchbook, blank note book with embossed leather cover. This journal perfect birthday gifts for anyone born in the zodiac Virgo. The book spine has three raised bands, which bands are the part of the bookbinding process, not only decorative details. This medieval technique (monastic bound) was already in use before finding of book printing (Work process: see Photo No. 9). The cover is dark olive green genuine leather. The front cover is decorated with embossed zodiac Virgo. The corners of the covers are slightly rounded. Endpapers are beige, printed with all zodiac motifs. The headbands are hand sewn from beige and brown cotton thread. The bookmarker are bronze color satin ribbon. 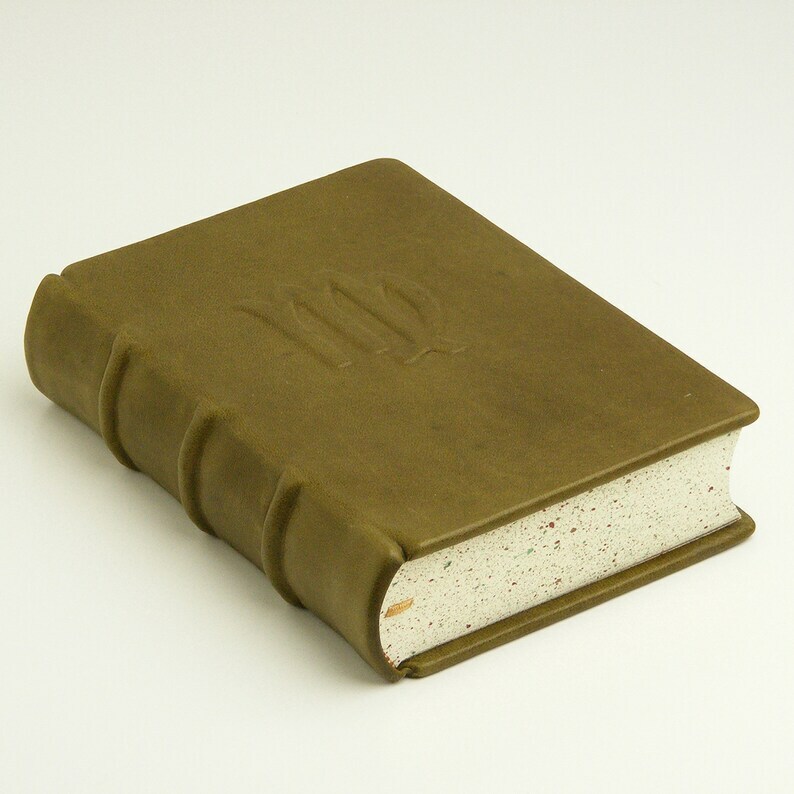 The bookblock is made from 120 g ivory, laid paper. 360 pages (180 sheets) are sewn-bound, handmade with thread. The edges of the pages are splashed with many colors: green, brown, burgundy. The dark brown canvas inner hinge is so strong and durable, the diary is usable for a long time. Size: 11.5 x 17 cm (4.6 x 6.8 inches). It is wonderful! Exactly as i wanted. You are a very skilled artist.Thank you! Eni is a very qualified boekbinder . Very very well done and every book is truly a wonderful piece of ART.